The tank in my 73 mach 1 has a fitting on top with 2 lines. These 2 lines are looped together with a rubber hose, there is also a electrical connection. The gas feed line is on the driver's side of tank, I believe this is correct. Is this is the correct tank? Where should lines on top be connected. The sending unit should be on the drivers side of the tank with 1 line and the electrical connections. Agreed with Don, here's a PDF from the MPC. (11-17-2018, 09:42 AM)Hemikiller Wrote: Agreed with Don, here's a PDF from the MPC. Thanks for the diagram, I must have a tank from a later model car. The PO did a lot of weird things to this car. Any chance for some pictures of it? In particular the fittings and connector on top, the gas line connection, and the inlet (filler) pipe connection. (11-17-2018, 12:00 PM)Don C Wrote: Any chance for some pictures of it? In particular the fittings and connector on top, the gas line connection, and the inlet (filler) pipe connection. I haven't been able to upload pictures. I sent a message to the administrator but haven't received any answer. It may be that I'm a junior member. I'm going to make a donation in a few minutes, maybe then I can add pics. rjpohl, all 71-73 Mustangs used the same fuel tank (D1ZZ-9002-A). The same fuel sending unit was used on all 71-73's (D1ZZ-9275-A---ID# D1ZF-AA, AB, AC) except the 71 429CJ. The sending unit shown in your photo looks similar to some I used to sell that fit the saddle tanks in F-600, 700 and 800 trucks. I'm sure others will agree, you just never know what your going to see next when dealing with work from the "Shade Tree Garage"! My illustration shows what the sender on your car should look like. 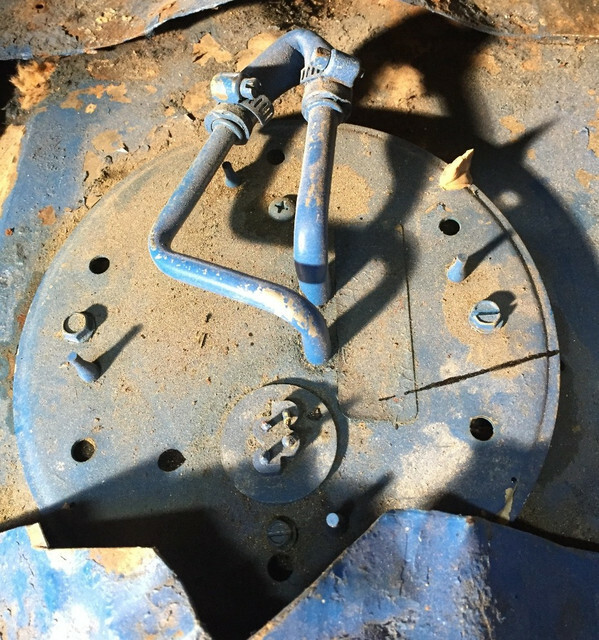 Since the original Ford unit is next to impossible to find, I would contact Don @ Ohio Mustang Supply and check with him on a sender (his has the brass float) and a new tank. Steve, the tank on OMS website looks like the Spectra Premium, which is made in Canada and 'turn coat' plated so it won't rust with Ethanol fuel. Arguably the best repo there is and that's what I would recommend. The sending unit looks good also, but my experience was it needed to be calibrated. Do it with 5 gallons (US) or 19 liters in an empty tank and adjust so it reads 1/4 full. It's the bottom end of the tank that is important, couldn't care less about if it reads full! !